What's happened to me?!?! It sure is difficult for me to blog these days. Most of my computer time is being spent at the Integral Education Forum. Recently I've been wondering about the role of 'transparency' in organizations. The deeper that I dive into my own personal practice of transparency and commitment to genuineness and congruence, the more I am surprised and amazed by what unfolds as I move through the world. So often transparency is associated with vulnerability that is then associated with being exposed and unprotected. The negative and ‘unsafe’ connotation that some of these words have often serve as blocks keeping people from taking risks and diving into the deep-end of possibilities. It’s one thing to make a decision as an individual to explore this territory; it seems to be a much larger commitment (and much more against the grain of the norm) to do so as an organization. Does any one else find this to be true? Please share any thoughts or observations you have regarding Transparency and organizations. Thanks! as we walk in the door from another long day at school and work, the children seem tired and irritated, maybe from the stress and struggles of the day, i have learnt as a parent to understand that when the kids get home they are able and need to release some of that stress! the bickering began and throughtout the evening the children were constantly annoying each other. i tried to stop them and realized as soon as i did it got worse as it was my attention they were needing! i stopped in my tracks and said "guys, whats happened to jared and zoe who always plays, laughs and helps each other" after a moment of silence zoe said to me "mom, i dont want to fight anymore, it makes me feel tired" i told zoe it would make me tired too! so she went and got a piece of paper and said "mom how do you spell, i like you everday" (zoe knows what letters to write, but does not know how to spell yet) i told her how to spell it and she gave it to jared. he smiled and then got a piece of paper and wrote "im sorry i hit you zoe" and gave it to zoe, she smiled and they were friends again! i then started to play with them. it made me realize the importance of specifically pointing out to the kids how positive they normally are! i have through this thought trained myself to see the positive side of things!! it makes me feel sooo much better. Chris at Parking Lot is a great mentor for me on holding space. Today he uses the story of the re-discovery of the ivory-billed woodpecker to teach about holding space and never giving up on anyone. 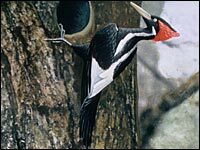 The honorable ivory-billed woodpecker has returned from the dead and is living in a wildlife refuge in the Big Woods of eastern Arkansas. It seemed to disappear in 1944 and was long presumed extinct. That admonition to never give up is an essential practice of holding space. In fact holding space, and the faith and dedication it demands, may be the most trusting thing one can do: imagining that the one who you are holding will eventually flourish, or return. If that wildlife refuge had never existed, a space held for the unconditional use of these animals, it's likely the woodpecker would be gone from North America for good and the Muskogee songs and healing processes that go with it would have slowly disappeared too. This is a lovely story about what it means to be connected to the world and what that connection demands of us. A friend writes to me, i looked out into the ocean....the water was rough and an anology came to me about the state of being i have found myself in. enter the unarmed journey into vulnerability. I continued to float, grateful for the wisdom my friend shared with me and in awe of his courage. I have a practice of periodically checking in with myself: If I were to die today, is there anything that I would regret? If so, is there anything I can do about that right now to dissipate that regret? Am I living my life in Integrity? Do I feel like my way of being is coming from the deepest place of truth that I know right now? Anything that comes up in response to these questions guides me towards action that I need to take if I wish to heal these wounded parts. Spring cleaning time! enter the unarmed journey into vulnerability. My heart is still pounding. Ice Cream That Helps Kids Play! Vote today and bring back KaBerry KaBOOM! From now until the end of May, fans of KaBerry KaBOOM! can vote online to bring it back from Ben & Jerry's infamous Flavor Graveyard. The winning flavor will be available at Ben & Jerry's Scoop Shops nationwide this fall. Not only that, but if KaBerry KaBOOM! wins, KaBOOM! will receive a portion of the proceeds for each scoop sold. So cast your vote today and bring back the flavor that supports a child's right to play! Simply go to The Flavor Graveyard and select KaBerry KaBOOM! from the drop down list. Every time you vote, you'll even get a coupon for $1 off a sundae or frozen beverage at your local Ben & Jerry's Scoop Shop. Now that's a sweet reward! You can vote once a day through May 31. Make your vote count and tell your friends...we need your support! The 'I' detached from a 'Thou' disintegrates. The truth begins with two." This Gestalt poem was shared on the Open Space list. When I think of heart I think of soul... it is the realm of our most heartfelt purposes.... our calling is found here....as Fredrick Buecher says: "Our calling is where our deepest gladness and the world's hunger meet." At one point Wilber says: "Buber talked about the I-Thou relationship--and the Big Mystery is that hyphen." How do you experience that hyphen? How do you connect with another's heart? How do you connect with your own heart?